Aron Nusbaum, M.D. is a Board Certified Dermatologist who specializes in hair restoration surgery, medical treatment of hair loss, platelet-rich plasma (PRP), and cosmetic dermatology. 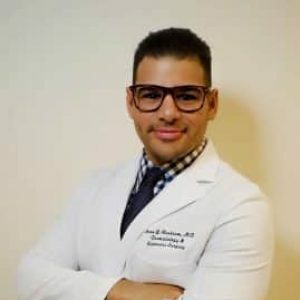 Dr. Nusbaum completed his Dermatology residency at Jackson Memorial Hospital/University of Miami where he received the Award for Excellence in Dermatologic Surgery and developed expertise in hair disorders under the training of world-renowned faculty in the field. He is also a graduate of the prestigious Medical Scholars Program at the University of Miami where he completed his Bachelor of Science and M.D. degrees with research distinction. Dr. Nusbaum has published multiple articles and book chapters in the medical literature focusing on medical and surgical hair loss treatment. He is known for his work in research having completed a Fellowship in Wound Healing and Regenerative Medicine where he received several First Place national awards. He is a member of the International Society of Hair Restoration Surgery, the American Society for Dermatologic Surgery and the American Academy of Dermatology. Dr. Nusbaum brings exceptional surgical skills and novel techniques for diagnosis and treatment of hair loss to our practice. In addition, he has started our Cosmetic Dermatology Division for men and women, and has the artistic sense to achieve aesthetic enhancement while maintaining a natural look, offering a variety of procedures such as botox, fillers, kybella, and PRP.